"Karen Glass, the 707 Rescue Team curator and historian that she is, took with her to Southend six (6) inaugural 707 flown covers. She graciously gave them to various Rescue Team members who were going to fly on XBA on her return to Australia. To carry them on that flight was going to be greatly symbolic. Karen, aka Green Hornet, had the idea that it would add greatly to the symbolism if a second franking at both departure and arrival were done. A few days before we left, Karen paid a visit to the Southend Post Office to put the proposal to the Postmaster. She was pleased to hear that he had been following the XBA story with keen interest, so when she suggested he might advance the official Southend stamp date by one day, so that they could be stamped the day before we left but with the actual date of departure, 8 December 2006, he readily agreed. It would not have been possible to have them franked on the real day, with a scheduled time of departure of 0700. 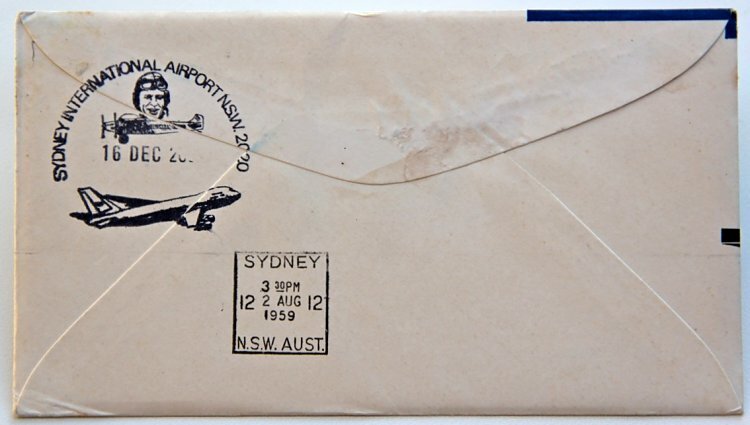 That end achieved, with the covers having made the journey securely protected in our luggage, Robert Phillips, who was a like-minded 707 memorabilia collector and who met the aeroplane on arrival, gathered the covers and with Karen in tow drove across to the Sydney Kingsford Smith International Terminal Post Office, where the precious covers were backstamped, marking our day of arrival. As Karen had done in Southend, Robert had visited the SKSA Postmaster the day before to organise it, so nothing was left to chance. 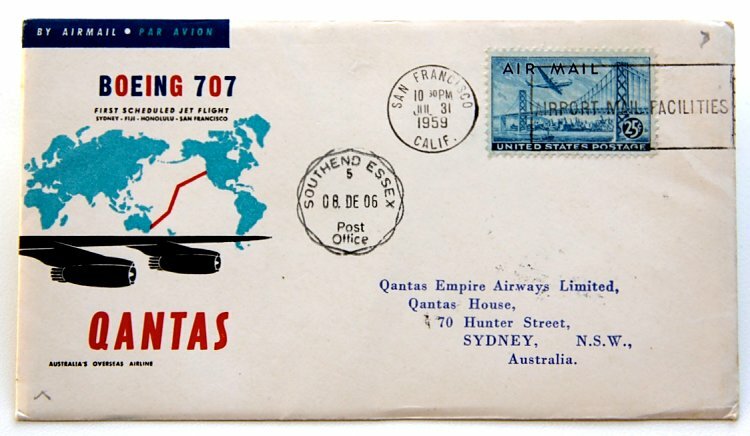 So, in the same way our 707 had been recovered, with planning and a sense of history, six of these very special twice-flown covers came to be franked this way and now form an important part of XBA collections around the country. In an aside, several bottles of Penfolds Bin 707 Cabernet Sauvignon received the same treatment (albeit more gently) and, like the flown covers, will likely never be opened."